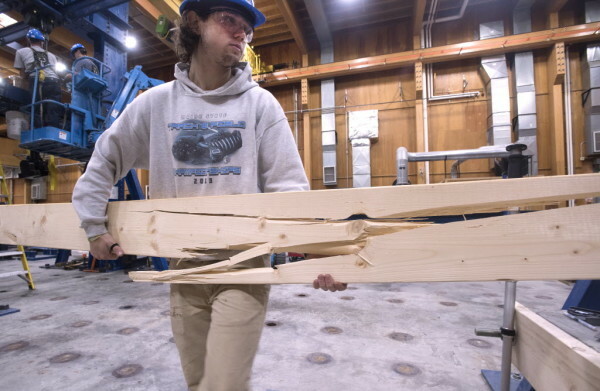 Rylan Norris removes a broken 2-by-6 board while testing Norway spruce lumber at the University of Maine Advanced Structures and Composites Center in Orono in this December 2015 file photo. 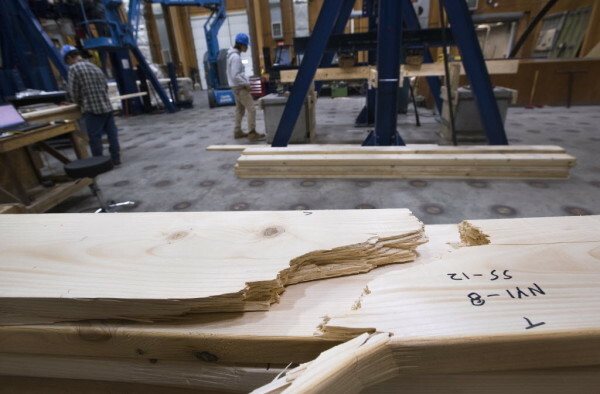 Norway spruce lumber is tested for strength to see how it would hold up as building material at the University of Maine Advanced Structures and Composites Center in Orono in this December 2015 file photo. 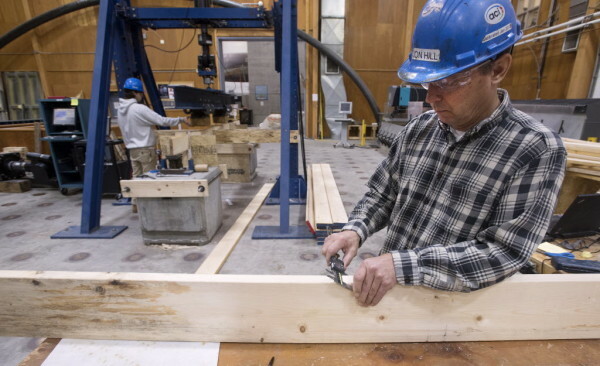 Technician Jon Hill records the exact measurements of a 2-by-6 board while testing Norway spruce lumber at the University of Maine Advanced Structures and Composites Center in Orono in this December 2015 file photo. ORONO, Maine — In a decision expected to serve as a boon for Maine’s lumber and forestry industries, a type of tree widely planted during the Great Depression has been cleared for use as a building material. Earlier this month, the American Lumber Standard Committee decided after extensive testing that the Norway spruce would be approved for use as construction-grade lumber. In Maine, the bulk of Norway spruce is in Aroostook County, though smaller plantations are scattered across the state, according to the Northeastern Lumber Manufacturers Association. The U.S. Forest Service estimates the Northeast is home to about 2 billion board feet — a unit for measuring wood volume that’s the equivalent of a board 12 inches square and 1 inch thick. The decision follows months of testing at the University of Maine’s Advanced Structures and Composites Center. Researchers and students at the center put the wood through the wringer, using hydraulic machinery to bend, pull and break Norway spruce boards while measuring and recording the stress with pressure sensors. They tested and broke more than 1,300 boards cut from trees harvested in Maine, Vermont, Wisconsin and four areas of New York. Norway spruce already had seen widespread use in Europe, according to Stephen Shaler, director of UMaine’s School of Forest Resources. The trees aren’t native to the United States, but they were introduced in large numbers during the Great Depression by the Civilian Conservation Corps, a group established by President Franklin D. Roosevelt to undertake conservation projects and put Americans back to work. The corps planted some 3 billion trees during its nine years in existence. The species has never been approved to be used as lumber in construction in the United States. It is used for other purposes, primarily as pulp and Christmas trees. Easterling said he believes it’s likely this news will lead to more widespread Norway spruce plantings in Maine now that it’s been cleared for use as construction lumber, a higher-value use than pulp. Most existing plantations are on former farmland, where the trees tend to thrive. The approval of Norway spruce opens up a new opportunity for Maine sawmills, which benefit from having a diversity of products to sell at market, he added. Tom Doak, executive director of the Small Woodland Owners Association of Maine, said people who own land with Norway spruce plantations will be able to sell it as a higher-value product. Anthony Hourihan, director of land development for J.D. Irving Lumber, said the company has planted more than 63 million seedlings since the late 1980s, and about 9 million of those seedlings have been Norway spruce. That share of Norway spruce could grow with the opening of this new use. This marks the first time in 80 years that a new type of wood has been added to the list of allowed woods under U.S. building standards. The Northeastern Lumber Manufacturers Association was heavily involved in the push to have it approved after hearing from landowners and sawmill owners who wanted to open up the higher-value use, Easterling said. “We are actively looking to buy Norway spruce now, and we’ll start buying it as soon as we can,” said Jason Brochu, president of Pleasant River Lumber in Dover-Foxcroft. Correction: An earlier version of this article incorrectly stated that the U.S. Forest Service estimates Maine is home to about 2 billion board feet of Norway spruce. It is the Northeast.